Here you will find some details about the very adaptable Red Eared Slider Turtle. This species of Slider turtle can range in size from 8 to11 inches, females are generally larger. In their natural habitat you can find these turtles in ponds, swamps and slow moving bodies of water like rivers and creeks. 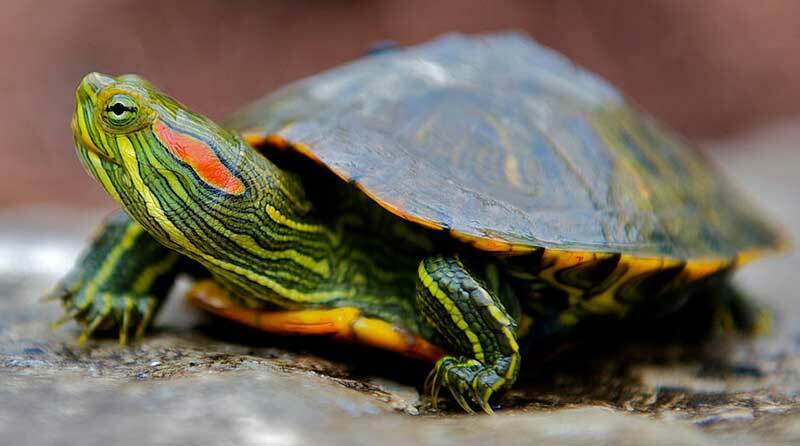 The Red Eared Slider is found all over the United States and they can also be found in Europe and Asia. The Slider turtle when kept as a pet can be maintained effectively in a larger aquarium. 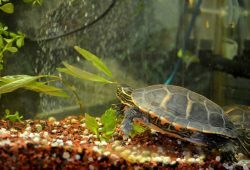 A sixty gallon aquarium can provide adequate housing for two adult Slider turtles. One basking area is a must which should also be easily accessible for them. A heat lamp and Full spectrum lighting is also highly recommended. 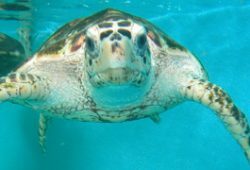 The water in the turtle tank should be kept near 70-75 degrees. The water should be cleaned using some type of watering filtration system to maintain water quality. At the bottom of the tank you need to provide ample amounts of small rocks for your pet turtle to dig into as they do enjoy to burrow. The Red Eared Slider has a progression from a carnivores diet as a juvenile to a predominant herbivores diet as an adult. 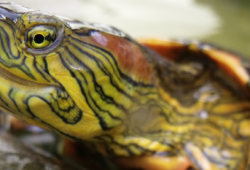 The Red Eared Slider Turtle does have a drive to gorge on protein so some turtle owners overfeed them, this can lead to health issues as liver and kidney damage. This is not to say that you should only feed them one or the other, but they should have a well rounded diet. A calcium supplement is also recommended by the advanced keepers, they believe that most of the feeder insects lack the calcium that most turtles require.